Free Shipping Included! Red Running Belt, Medium, VerveBelt, Best for Yoga, Running, Sports, Walking, Traveling, Elastic Key Strap with 4 pockets, for Men & Women by Verve at Wander Soul. Hurry! Limited time offer. Offer valid only while supplies last. Welcome to one of the most reliable brands on Amazon, where you can find the most convenient and functional active wear accessories on the market! Welcome to one of the most reliable brands on Amazon, where you can find the most convenient and functional active wear accessories on the market! 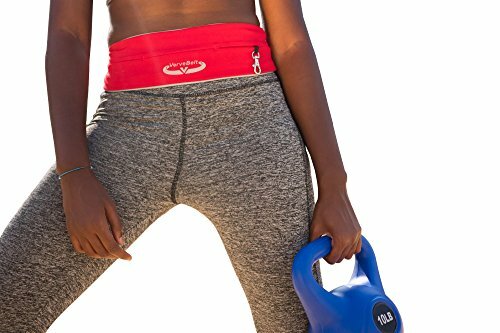 This improvise activewear belt is made of high quality Micro-Poly and Spandex blend material that is soft, durable, breathable, sweat-proof and comfortable to wear. It will never break, tear apart easily or lose its eye catching design and will last for a long time. It has a reflective silver logo & strips for your safety while running and biking in any low light condition. This waist belt is hands-free and accessible with 4 internal pockets system and elastic key strap that enables you to put some important things inside when going to the gym or some other outdoor sports or physical activities. You can keep your phone, keys, gel packs, credit cards, money, ear phones, ID, asthma inhaler, insulin pump and more things that can fit in the belt. This belt is not just for one purpose, it's widely use in different kind of activities both indoors and outdoors for walking, running, hiking, jogging, cycling, biking, gym workout, yoga fitness and more. For daily use at work, school and traveling this is a great secret pocket for your valuable things just simply turn the belt inside out and everything is more secured. This waist belt pouch is very soft that won't leave any irritation on your skin, super lightweight which you can't feel any discomfort while moving or exercising. Easy to wear it doesn't move, jiggle, bounce or chafe just choose the right size for you. We Provide you a 30-day money back guarantee on every purchase. ★ WON'T RIDE UP, BOUNCE OR CHAFE - OUCH! At VerveBelt we understand cotton is the worst thing to wear for exercise - it causing chafing. Our workout belt is made of micropoly and lycra for fast drying and wicking - So scrap your ugly fanny pack. Yes, the hand-me-down-one and start accessorizing your CrossFit clothing or marathon running belt with a VerveBelt TODAY! ★ DO YOU LOVE MARATHON RUNNING? We love the occasional 10K ourselves. Have you reached for your old sports armband only to realize it doesn't fit your smartphone? Are you tired of purchasing a new iPhone running armband whenever you upgrade iPhone's or to your new Samsung? No Worries, VerveBelt is the best iPhone running accessories runners belt waist pack offering you a slim, yet roomy storage with an ergonomic design to accommodate any smartphone and personal items. ★ YOUR BODY IS A REFLECTION OF YOUR LIFESTYLE! So is your fitness belt. With a VerveBelt - Sweat is no problem! Our belts are machine washable and designed to complement most fitness regime. Compliment your yoga belt -only with a VerveBelt. ★ Pickpockets Beware - Travelers Relax! Best travel accessories easily hide this waist pouch underneath clothing keeping your valuables out of sight. VerveBelt can double as a money belt. Wear under your clothes and be a step ahead of pickpockets. Choose the VerveBelt slim and modern design versus an indiscreet bulky travel fanny pack. ★ CASH-BACK GUARANTEE - If you ordered wrong size or if you decide you no longer need our VerveBelt, return it and we will process a 100% refund for your product. If you're not satisfied, we don't deserve your money.